TransitFlor® provides a variety of proprietary rubber and steel backed rubber treads to match our flooring. Available with both stainless steel or galvanized backings, our treads are fused (cured) to the steel during the manufacturing process (rather than being glued like our competition) to produce a superior tread that will stand the test of time in the most demanding applications. Step treads are fully ribbed front to back to channel water out of the stepwell for fast drainage and easy cleaning. The high-contrast white or yellow nosing meets or exceeds ADA guidelines with most colors. For applications that do not require a full step tread, step edges are available to place along the front edge of a step and are the same double-grooved design found in our rib flooring and step treads. 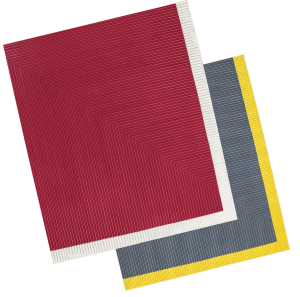 The color contrast and optional abrasive strip provide an extra measure of safety. 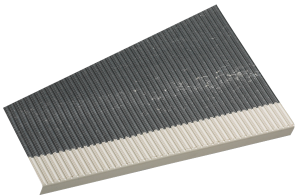 Talon Treads™ are fully ribbed TransitFlor® step treads with an abrasive strip inserted along the nose of the tread. 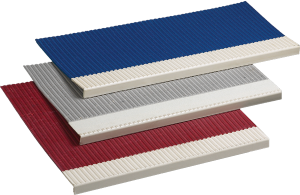 Available with a 2.5” or 3.5” (depending on desired thickness of the tread) wide abrasive strip insert for safer passenger boarding and discharge. 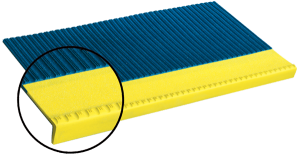 For extra foot traction and easy cleaning, Apex Step™ Treads feature a large, cone-shaped nub design. The rubber surface is bonded to a preformed metal backing plate. Leading edge nosing can be high-contrast yellow or white. Meets ADA guidelines for slip resistance and color contrast. 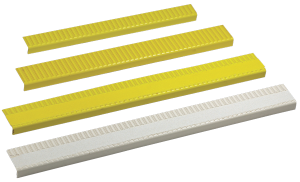 All available tread styles can be custom pre-cut molded ribbed stair treads with high-contrast yellow or white nosing for special applications. TransitFlor’s service helps reduce errors, installation times and scrap disposal concerns. Simply provide a dimensional drawing. Made of a slip-resistant molded ribbed rubber compound, TransitFlor® entrance plates feature high contrast 3″ yellow or white leading edge bands on the nose and a 2″ standee line for better visibility and ADA compliance. A seamless miter design provides increased integrity and eliminates dirt-catching crevices. An abrasive leading edge is also available. TransitFlor® has the largest selection of entrance tread plate molds in the industry.